After leaving Philippi, Paul and Silas made their way to Thessalonica. They were there privileged to address a large concourse of people in the synagogue, with good effect. Their appearance bore evidence of their recent shameful treatment, and necessitated an explanation of [p. 82] what they had endured. This they made without exalting themselves, but magnified the grace of God, which had wrought their deliverance. The apostles, however, felt that they had no time to dwell upon their own afflictions. They were burdened with the message of Christ, and deeply in earnest in his work. Paul made the prophecies in the Old Testament relating to the Messiah, and the agreement of those prophecies with the life and teachings of Christ, clear in the minds of all among his hearers who would accept evidence upon the subject. Christ in his ministry had opened the minds of his disciples to the Old-Testament scriptures; "beginning at Moses and all the prophets, he expounded unto them in all the scriptures the things concerning himself." Peter, in preaching Christ, produced his evidence from the Old-Testament scriptures, beginning with Moses and the prophets. Stephen pursued the same course, and Paul followed these examples, giving inspired proof in regard to the mission, suffering, death, resurrection, and ascension of Christ. He clearly proved his identity with the Messiah, through the testimony of Moses and the prophets; and showed that it was the voice of Christ which spoke through the prophets and patriarchs from the days of Adam to that time. He showed how impossible it was for them to explain the passover without Christ as revealed in the Old Testament; and how the brazen serpent lifted up in the wilderness symbolized Jesus Christ, who was lifted up upon the cross. He taught them that all their religious services and ceremonies would have been valueless if they should now reject the Saviour, who was [p. 83] revealed to them, and who was represented in those ceremonies. He showed them that Christ was the key which unlocked the Old Testament, and gave access to its rich treasures. Thus Paul preached to the Thessalonians three successive Sabbaths, reasoning with them from the Scriptures, upon the life, death, and resurrection of Christ. He showed them that the expectation of the Jews with regard to the Messiah was not according to prophecy, which had foretold a Saviour to come in humility and poverty, to be rejected, despised, and slain. He declared that Christ would come a second time in power and great glory, and establish his kingdom upon the earth, subduing all authority, and ruling over all nations. Paul was an Adventist; he presented the important event of the second coming of Christ with such power and reasoning that a deep impression, which never wore away, was made upon the minds of the Thessalonians. They had strong faith in the second coming of Christ, and greatly feared that they might not live to witness the event. Paul, however, did not give them the impression that Christ would come in their day. He referred them to coming events which must transpire before that time should arrive. 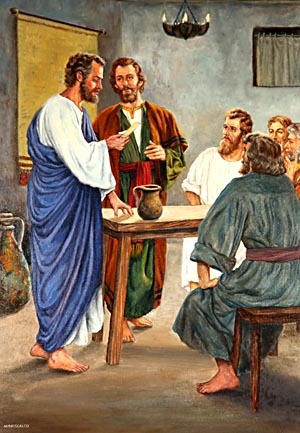 Writing to them afterwards, he warned them that they should "be not soon shaken in mind, or be troubled, neither by spirit, nor by word, nor by letter as from us, as that the day of Christ is at hand. Let no man deceive you by any means; for that day shall not come, except there come a falling away first, and that man of sin be revealed, the son of perdition." Paul foresaw that there was danger of his [p. 84] words being misinterpreted, and that some would claim that he, by special revelation, warned the people of the immediate coming of Christ. This he knew would cause confusion of faith; for disappointment usually brings unbelief. He therefore cautioned the brethren to receive no such message as coming from him. In his Epistle to the Thessalonians, Paul reminds them of his manner of laboring among them. 1 Thess. 2:1-4. He declares that he did not seek to win souls through flattery, deception, or guile. "But as we were allowed of God to be put in trust with the gospel, even so we speak; not as pleasing men, but God, which trieth our hearts." Paul rebuked and warned his converts with the faithfulness of a father to his children, while, at the same time, he cherished them as tenderly as a fond mother would her child. When the Jews saw that the apostles were successful in obtaining large congregations; that many were accepting their doctrines—among them the leading women of the city, and multitudes of Gentiles—they were filled with envy and jealousy. These Jews were not then in favor with the Roman power, because they had raised an insurrection in the metropolis not long previous to this time. They were regarded with suspicion, and their liberty was, in a measure, restricted. They now saw an opportunity to take advantage of circumstances to re-establish themselves in favor, and, at the same time, to throw reproach upon the apostles and the converts to Christianity. This they set about doing by representing that the leaders in the new doctrine were raising a tumult among the people. They accordingly [p. 85] excited the passions of the worthless mob by cunningly devised falsehoods, and incited them to make an uproarious assault upon the house of Jason, the temporary home of the apostles. This they did with a fury more like that of wild beasts than of men. They had been instructed by the Jews to bring out Paul and Silas, and drag them to the authorities, accusing them of creating all this uproar, and of raising an insurrection. When they had broken into the house, however, they found that the apostles were not there. Friends who had apprehended what was about to occur, had hastened them out of the city, and they had departed for Berea. In their mad disappointment at not finding Paul and Silas, the mob seized Jason and his brother, and dragged them before the authorities with the complaint: "These that have turned the world upside down are come hither also; whom Jason hath received; and these all do contrary to the decrees of Caesar, saying that there is another king, one Jesus." The Jews interpreted the words of Paul to mean that Christ would come the second time in that generation, and reign upon the earth as king over all nations. The charge was brought against the apostles with so much determination that the magistrates credited it, and put Jason under bonds to keep the peace, as Paul and Silas were not to be found. The persecuting Jews flattered themselves that by their course toward the Christians they had regained the confidence of the magistrates, and had established their reputation as loyal citizens, while they had, at the same time, gratified their malice toward the apostles, and transferred to the converts to [p. 86] Christianity the suspicion which had heretofore rested upon themselves. In his first Epistle to the Thessalonians, Paul says, "For our gospel came not unto you in word only, but also in power, and in the Holy Ghost, and in much assurance; as ye know what manner of men we were among you for your sake. And ye became followers of us, and of the Lord, having received the word in much affliction, with joy of the Holy Ghost; so that ye were ensamples to all that believe in Macedonia and Achaia." Those who preach unpopular truth in our day meet with determined resistance, as did the apostles. They need expect no more favorable reception from a large majority of professed Christians than did Paul from his Jewish brethren. There will be a union of opposing elements against them; for however diverse from each other different organizations may be in their sentiments and religious faith, their forces are united in trampling under foot the fourth commandment in the law of God. Those who will not themselves accept the truth are most zealous that others shall not receive it; and those are not wanting who perseveringly manufacture falsehoods, and stir up the base passions of the people to make the truth of God of none effect. But the messengers of Christ must arm themselves with watchfulness and prayer, and move forward with faith, firmness, and courage, and, in the name of Jesus, keep at their work, as did the apostles. They must sound the note of warning to the world, teaching the transgressors of the law what sin is, and pointing them to Jesus Christ as its great and only remedy. Click here to read the next chapter: "Paul at Berea and Athens"